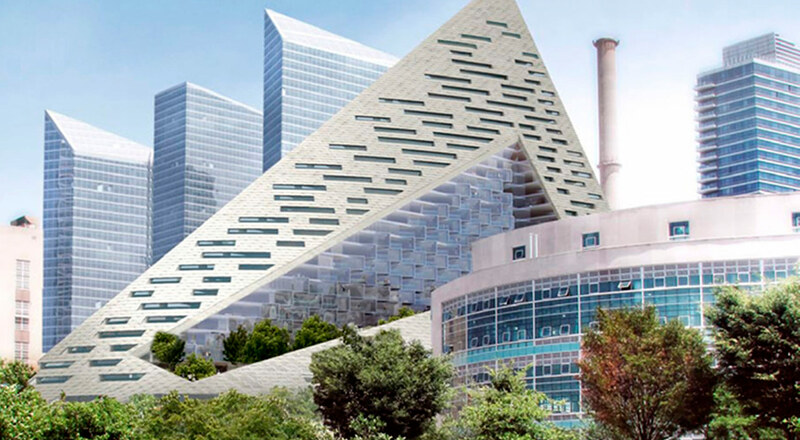 It is now nearly a year since Project W57, by Bjarke Ingels Group (BIG), was approved; an innovative skyscraper in the form of a pyramid in the West Side Highway district of New York. With just a few months to go before the building’s delivery deadline, the structure is already in its final phase and can be admired in all its splendour. With Project W57, Bjarke Ingels Group (BIG) has chosen to introduce a new style of residential building into the Big Apple’s profile, a hybrid of Copenhagen apartment blocks and traditional US skyscrapers. The building takes the form of a kind of urban dune, with its highest point in the north-eastern corner, meaning that many of the 600 apartments offer vistas of the Hudson River without interfering with views from the neighbouring building, the Helena Tower. Each apartment has its own unique size and layout, and all of them rest atop a communal level spread over two floors which houses spaces for the cultural and commercial requirements of the community. Notable amongst its more curious features is the park the size of a football pitch located inside this splendid building. The park is totally private but can be admired from outside, offering an impressive image alongside the Hudson River. Additionally, the skyscraper boasts a striking roof which has been perforated to create south-facing terraces for residents of the building to enjoy. Right from the outset the project has aroused considerable controversy on the subject of affordable housing, in that the architects fixed the entry prices too high. Finally New York City Council approved the project unanimously, with the result that the building will offer 173 dwellings at reasonable prices out of the total of 750 that the space will contain. This is a building designed with perfection in mind, offering design which is simultaneously efficient and intimate, taking the maximum advantage of daylight hours. The truth is that experts are talking about this structure as being more original than practical. BIG from DRKHRSE on Vimeo.